There were plenty of interesting happenings at Macworld/iWorld; here are a few that caught our eye. The Bowblade helps to bring a more physical aspect to iPhone gaming, with a controller shaped like a bow. 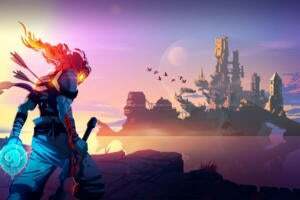 The picture doesn't do it justice, as the contraption has to be drawn like a normal bow in order to dispatch enemies or hit targets on your phone. 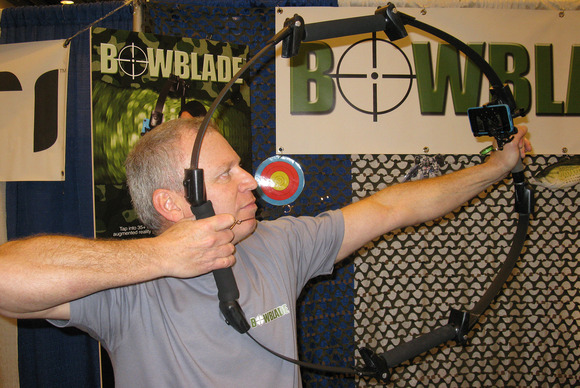 Check out a video of the Bowblade in action. 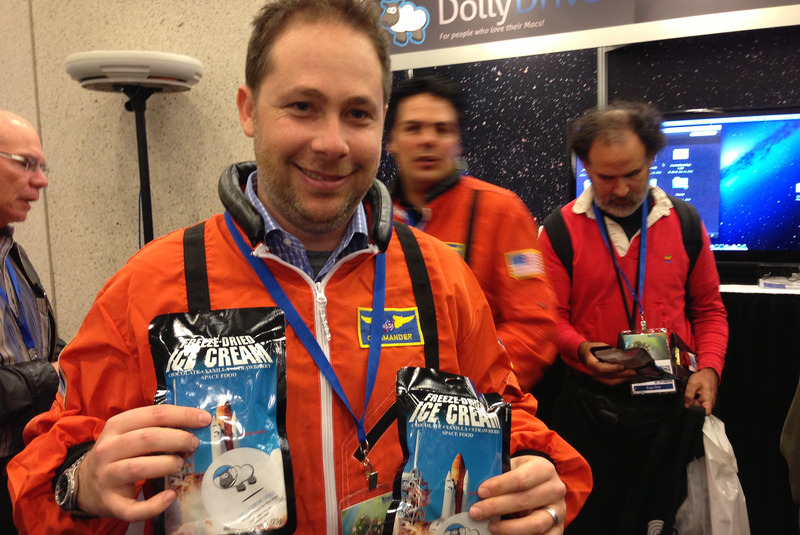 Dressed in orange NASA jump suits, Dolly Drive personnel handed out space ice cream to promote the Web service's new Space feature (booth #442). Announced at the show, Dolly Space gives users hard-drive space in the cloud. "It's like Dropbox meets iDisk," explained Adam Wolman, DollyDrive's president. 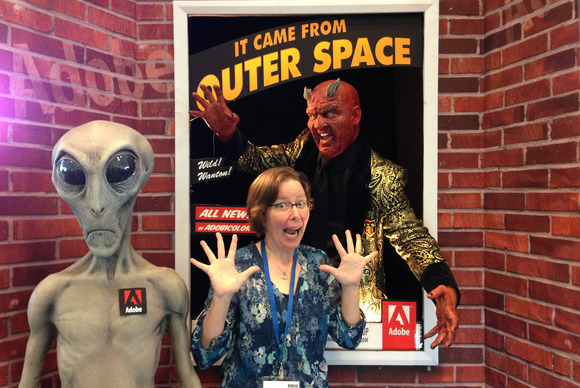 Aliens, devils, and men in top-hats hammed it up with show-goers in the Adobe photo booth (2nd floor). Adobe's photo-sharing app Adobe Revel lets you upload images from your iPhone or iPad to the cloud, enhance and edit them, sync across devices, and share with your social networks. The free version of the app offers unlimited photo uploads for the first month and 50 per month thereafter. A premium version, with unlimited photo uploads, is $5.99 a month. Booming tunes and women in roller skates promoted Scratch Tracks audio and computer accessories, including fanny packs with speakers, robot-shaped self-powered speakers in beanies, and rubber iPhone and iPad cases shaped like game controls (booth #802). For good measure, the company also offered a generous helping of fixed gear bikes. We want to make things funky and portable, said Mimi Masher (left). "Why are we here?" 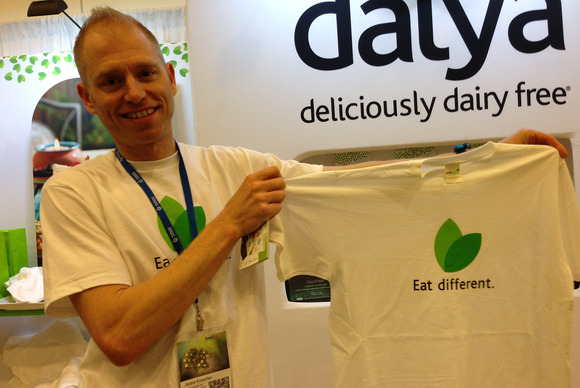 asked Daiya Food's VP Andre Kroecher when a reporter wondered about the non-dairy cheese maker's prominent booth (#100) at the entrance to the show. "Look up there--Mac and cheese!" Show-goers browsed samples of grilled-cheese sandwiches, pizza, and bits of the tapioca-based cheese substitute itself. 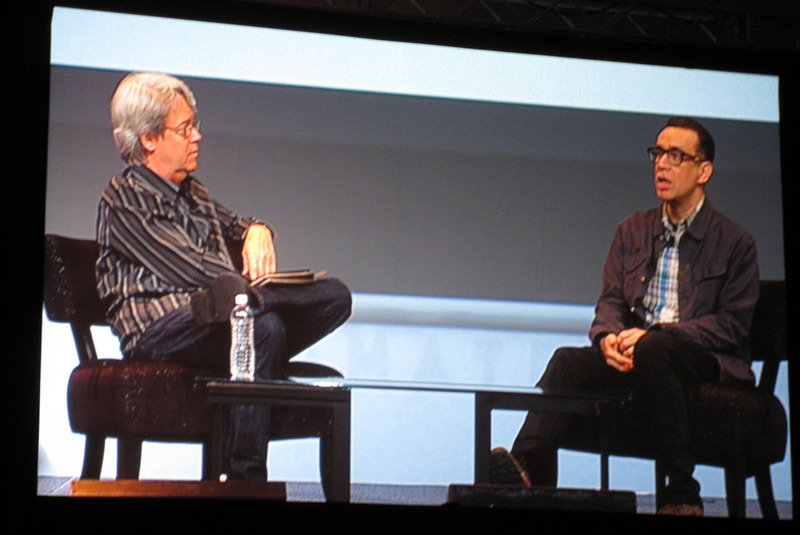 Macworld's Chris Breen and actor Fred Armisen kick off day two of Macworld/iWorld. Armisen talked about his TV show, Portlandia, how he uses tech to write show episodes, playing Steve Jobs on Saturday Night Live, and how he enjoys doing his impression of Queen Elizabeth. Just like a video game, right? David Cann, Double Robotics CEO commented as he thumbed the onscreen controls for the robot rolling back and forth in front of him. 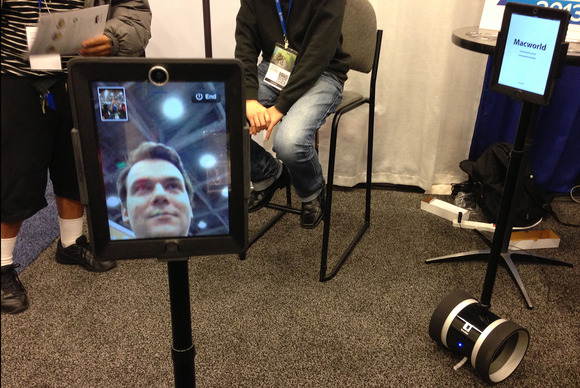 This telepresence robot is low-priced compared to similar robots we've seen before, which can cost up to $15,000; this one costs $1,999 for pre-orders. Its head is an iPad that you supply. The Double is also controlled via iPad and can move up and down, rising to about 5-feet tall, and wheel itself around as you like.